Last weekend, I was talking to a friend how my commuting bike was 18 years old. I bought the Trek second-hand in 2000. 18 years is pretty good when you consider bike theft rates in the UK. Because I’ve had it so long and because it’s not worth too much, I can use without excess fear of getting stolen. The lock I use in town is not flimsy, but it’s not indestructible. For quite a few years, I researched new commuting bikes (they made nice review pages on cyclinguphill.com). But, when it came to it I never got round to buying a new bike. Fear of being stolen was a strong factor in sticking with an old second-hand bike. It is not just the fear of being stolen but also peace of mind. If you have an old banger, you don’t worry so much about leaving it around town. Anyway, I got back home, from a brief trip to Yorkshire to find the bike locked up outside my house had had its wheels stolen. 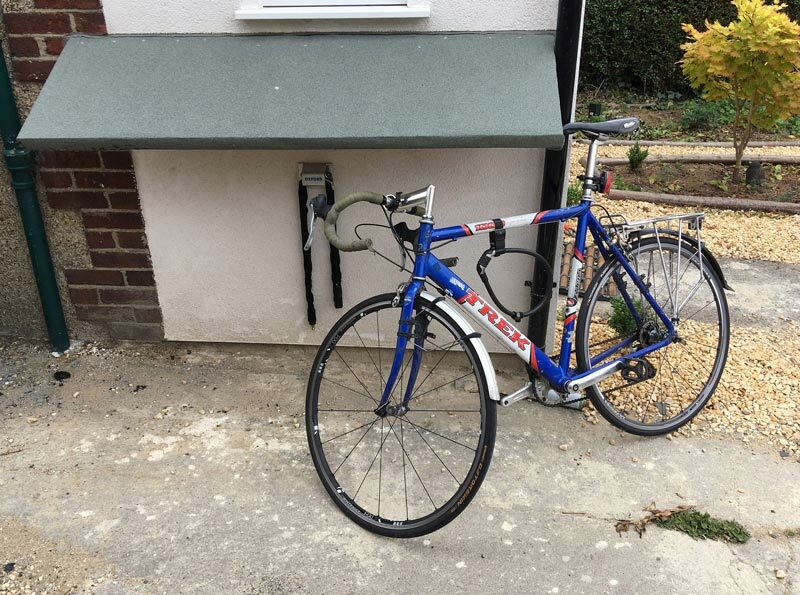 The bike was still there – secured by a strong lock. But, it was surprisingly expensive to buy a new set of wheels. I could almost have bought a new complete bike. When wheels get stolen, you have to buy. It set me back £160+ and that was from finding the cheapest components at Wiggle. My tale of woe didn’t quite end there. If you don’t do bike maintenance frequently, you can forget certain things (or at least I do). I spent ages putting the new tyres on. The next morning the front tyre had already gone down, so I took a front wheel off a good bike to get into town. On the way back, I bought some shopping from Tesco but the weight caused a puncture and I was stranded 1 mile from home. Fortuitously, I was right next to a bike shop, so I went in to buy a new inner tube. But, at £7 for a new inner tube, I didn’t want to pay and fix by the side of the road, so I cycled home on a flat tyre with heavy shopping on the back. Another advantage of the Schwalbe Marathon Plus tyre is that it works pretty well to cycle on a flat tyre. I cycled slowly trying to put weight on the front wheel, which is difficult when you have a bag of groceries on the back. Removing the back wheel, my schoolboy error dawned on me. I had forgotten the rim tape, so punctures were caused by inner tube next to sharp wheel edges. I put an old racing wheel and cycled to Beeline bicycles on the 12 sprocket (10speed cassette works on 9-speed chain, as long as you don’t want to change gears.) I had a nice chat with the workers and bought some very cheap rim tape. It reminded me how much nicer it is to have interaction with real people in a real bicycle shop, yet I had just spent £160 online because it was cheaper. Here I was spending only £3 to get some rim tape. I will make a conscious effort to support local bike shops; they are much better than online experience. But, when you can save 50%, and you’ve just had your wheels stolen it’s hard not to think of saving money. It’s a real modern dilemma, which is perhaps worthy of another post, I’m not sure of the solution. I think the solution is maybe for local bike shops to charge more for express bike fitting service. Then I could have got new wheels fitted properly and avoided a double puncture experience. So there you go – another riveting cycle experience. It’s almost as exciting as the bike pump which deflated my tyres! I feel your pain here. Just to complicate matters, there’s a lot of different sorts of rim tape too! Personally, I like Continental’s high pressure tape which works much better than the cheap, fabric stuff that my LBS sold me and lasted three rides before starting to eat inner tubes. The Conti stuff will take whatever pressure you can get in the tyres without missing a beat. It’s also worth considering tubeless, but for road this generally means specific rims and specific tyres as it’s not as easy to retro-fit as it is on an MTB due to the higher pressures involved. A good example of the difficulty here is Conti’s excellent GP4000s which don’t support tubeless at all, so it’s a bit of a “one or the other”. I only switched when my rim sidewalls finally became thin enough to see daylight through and decided to swap tyres at the same time (Schwalbe Pro One) – very easy to setup and ride very nice with the added bonus of a higher level of puncture protection. Yey! At least with tubeless you don’t need to worry so much about the rim tape as it’s job is now only to keep the air in, so a couple of turns of electrical tape, gorilla tape (I like Tesa 4289 – the stuff that Stans relabel for their own product) will suffice to keep things in their right place.